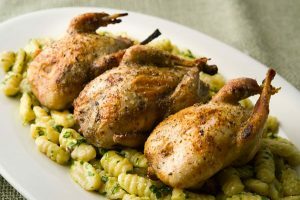 Roasting quail is a bedrock skill for any quail hunter or any home cook interested in game birds. And while a pretty plucked quail may look like a tiny chicken, they are different enough to warrant their own recipe. Quail come in various sizes and flavors, ranging from the mild, soft and tiny coturnix quail, which are the quail most people buy in the store, to the slightly larger and more flavorful bobwhite quail, which can also be bought in some stores, to the similarly sized and even more flavorful Valley, Mearns, Gambel’s or scaled quail — four species that taste very similar — to, finally, the large mountain quail of California’s Sierra Nevada. Mountain quail are a bit darker and gamier than the other quail species, but not so much that you need to cook them differently. 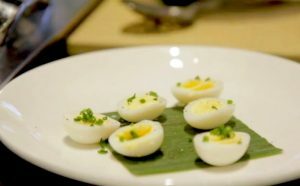 This is a basic roast quail recipe that can serve as a stepping stone for other, fancier recipes. Once you know how to properly roast a quail, you can then play with glazes or marinades — even though I am not normally a fan of marinades, they will work with quail because the birds are so small. If you choose to brine your quail, boil the water or wine with the kosher salt and bay leaves, then turn off the heat and let cool. Submerge the quail in this brine for 2 to 6 hours. Preheat your oven to 500°F, or if it doesn’t get that hot, as hot as your oven will go. This will take a little while for most ovens, up to 30 minutes. While the oven is preheating, take the quail out of the fridge and pat them dry. Coat with lard, olive oil or butter (your quail will be browner with melted butter) and salt generously. Set aside at room temperature while the oven heats. When the oven is hot, get a small roasting pan or cast-iron frying pan and set the quail in it. They will want to tip over, so steady them with cut pieces of the celery stick. 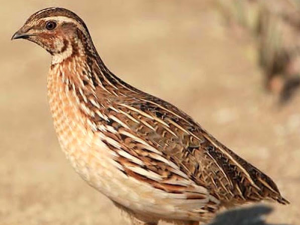 Try to prevent the quail from touching each other to speed the cooking process. Roast the quail in the oven for 12 to 18 minutes. The lower end of the spectrum will give you quail that are juicy, succulent and a little pink on the inside — but pale. 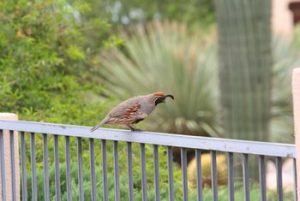 The higher end of the spectrum will give you a fully cooked, browner quail, but one that is at the edge of being dry. Your choice. When you take the quail out of the oven, place on a cutting board and rest for 5 to 10 minutes. Use this time to make the wild game sauce of your choice, or just squirt lemon juice on the birds before serving. I include a brining step here if you like brining. If you do brine your quail, they will be more tender and you can cook them a few minutes longer — but you run the risk of them becoming too salty. Don’t brine too long! If you don’t brine, the meat will have a nicer texture, but you have less room for error when you roast them.